Reading has always been an important part of learning and an enjoyable pastime. 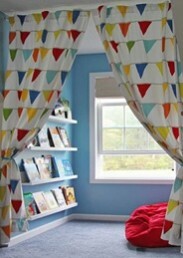 Reading nooks provide comfortable, quiet places to escape and curl up with a good book. Keep in mind, they aren't just for reading, either. Actually, a nook is where your child can settle down and do what he/she enjoys – drawing, writing or listening to music. A reading nook is the perfect way to set aside a peaceful spot in a room. The reading spot should set a peaceful tone in the room. The nook could be in set up in a corner of the room, near a windowsill, closet (of course, doors and clutter removed then design), or any unused space in the home. Start with the Seating. What does your child prefer – a comfy chair, large throw pillows (white, blue or green create a restful mood), or maybe a beanbag. Make it comfortable and inviting. Lighting. 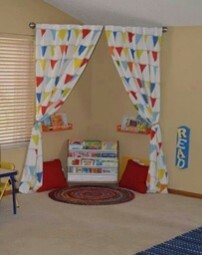 Ensure there is ample lighting, you don’t want your child to squint while trying to read his/her favorite story. Not too bright, not too dim – balance between lighting needs and their level of comfort. For daytime reading, nothing beats the natural sunlight beaming through the window (as shown in the photo – window book nook). For evening reading, a floor lamp, a side table lamp or an adjustable wall-mounted light. Shelving. Books can be placed on floor shelving units or wall mounted. Keep in mind the child should easily gain access to the books. Make it easy to retrieve a book and to replace the book after reading. Color: Use bright, happy colors. Sectionalizing a Space. As shown in the photos, you can use curtains, sheets, shower curtains on a shower rod. Circular band attached close to the ceiling and drape soft material to make a princess canopy for a girl or material with adventure designs for a boy. Special Touch to the Nook. First consider if added touches would be too distracting for your child. If not, then consider using different toys to decorate the space. Create themes around their favorite books. For example, if your child is a Harry Potter fan, use a cloak, a wand or figurines. Scents. If your child likes or requires a fragrance to relax, use a diffuser with lavender or their favorite scent. Background Sounds. If soft, relaxing sounds don’t distract your child while reading, try CDs of flowing water or Rain forest sounds. Just make the nook their personal space. Enjoy!